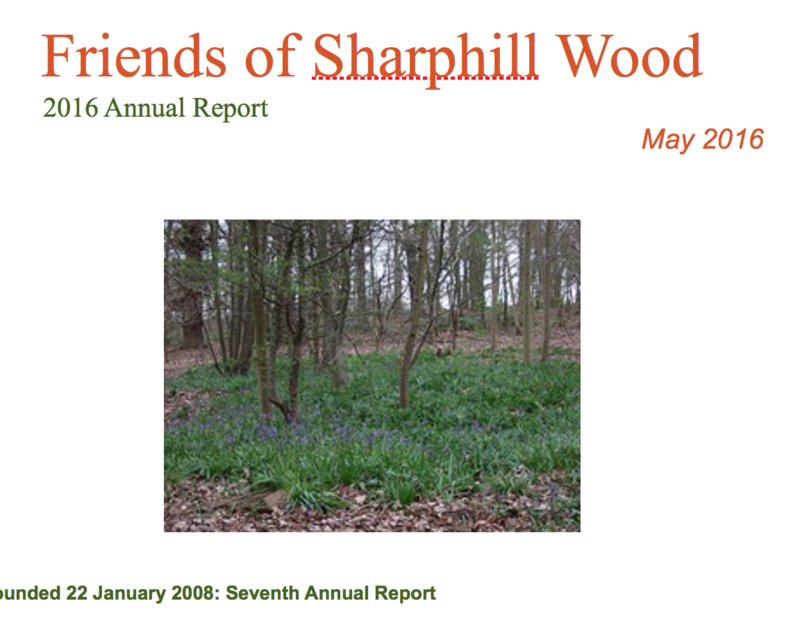 There were 9 meetings of the Friends of Sharphill Wood in the year to 10 May 2016. The Annual General Meeting, postponed to 9 June 2015, elected Phil Miller (Chair), Mike Rivett (Vice Chair), Chrissie Wells (Treasurer), Jo Miller (Publicity Officer) John Elwell (Work Party Coordinator) and Bill Logan (Secretary). There were 102 Friends on the circulation list in May 2016. A meeting was held on 12 February with Rushcliffe Borough Council to pursue mitigating measures in the light of planning permission for housing surrounding the wood. Our main concerns are that the proposed community park does not extend beyond the west of the wood, control of Section 106 monies to maintain the wood and location of the promised store facilities. At the time of writing we are making arrangements to pursue these and other issues with the developers. We have postponed meeting with Rushcliffe Borough Council and Nottinghamshire Wildlife Trust to review progress with the Management Plan and other concerns.